The University of Toronto (UofT) and the University of Central Asia (UCA) signed a memorandum of understanding to build linkages through curriculum and faculty development, faculty and student mobility and joint research collaborations. The first initiative under this agreement foresees UofT’s Computer Science Department develop UCA’s undergraduate Computer Science curriculum to be delivered at its recently launched campus in Naryn, Kyrgyz Republic. The signing ceremony took place at the University of Toronto, Canada. AKIPRESS.COM - The University of Central Asia’s Institute of Public Policy and Administration (UCA IPPA) celebrated the first graduates of its Certificate Programme in Mining Policy and Sustainable Development on December 19. The eight-week executive programme for civil servants, experts, and civil society representatives involved in extractive industries aimed to develop a pool of informed professionals who can improve the quality of public discussion within the mining sector, UCA said. 21 graduates received their certificates at a ceremony held in Bishkek attended by Robin Ord-Smith, British Ambassador to Kyrgyzstan, Ulan Ryskulov, Deputy Chairman, State Committee of Industry, Energy and Subsoil Use of the Kyrgyz Republic, Dr Shamsh Kassim-Lakha, Chairman, Board of Trustees, University of Central Asia and Dr Bohdan Krawchenko, UCA Director General and Dean of Graduate Studies. Dr. Bohdan Krawchenko congratulated graduates and remarked the programme is essential in preserving and promoting knowledge exchange and the sharing of best practices to the mining sector. “The mining sector plays a pivotal role in Kyrgyzstan’s development, and this certificate programme equips future leaders with the tools and resources needed to understand the kinds of policies required for the sustainable development of this sector,” said Dr Krawchenko. The University of British Columbia (UBC) in Vancouver, Canada, and the University of Central Asia (UCA), whose central administrative office is located in Bishkek, Kyrgyz Republic, signed an agreement to enable UBC to design curriculum for 22 courses that will be used by UCA faculty members to teach the Earth and Environmental Sciences Programme to UCA students. The Memorandum of Understanding (MOU) was signed by the President of UBC, Professor Santa J. Ono, and Dr Shamsh Kassim-Lakha, Chairman of the Board of Trustees of UCA, in Vancouver last week. “I am excited by this initiative and the chance to partner with a new university in an often underserved part of the world,” said UBC President Santa Ono. EDITOR’S NOTE: This is part two of a three-part Devex series that examines the Aga Khan’s plan to create a new model for higher education in Central Asia, where the opportunity to achieve academic excellence is usually found somewhere else. Read part one here. Inside Ian Canlas’ science classroom, students are discussing their grades on a recent homework assignment. One of them asks Canlas why he deducted points from an answer that seemed generally correct. “Because you did not have a complete idea,” Canlas says. The students are grouped around open tables, seated in lime green cushioned swivel chairs. A few of them have laptops open. Most are casually dressed in t-shirts and hoodies, except for one who wears a black suit. The tone is informal, familiar. They call Canlas by his first name, Ian, which rhymes with lion. While it is not unheard of for high-achieving — or well-connected — students from Central Asia’s rural regions to access top-notch universities, it usually requires their families send them to a capital city or abroad, and — if they’re not lucky enough to earn a scholarship — pay a steep tuition. With or without financial assistance, young people who don’t have access to a quality university nearby face a difficult choice: leave home and family to pursue it, or make the best of what’s around. The University of British Columbia (UBC) in Vancouver, Canada, and the University of Central Asia (UCA), whose central administrative office is located in Bishkek, Kyrgyzstan, have signed an agreement to enable UBC to design curriculum for 22 courses that will be used by UCA faculty members to teach the Earth and Environmental Sciences Program to UCA students. According to UCA, the Memorandum of Understanding (MoU) was signed by the President of UBC, Professor Santa J. Ono, and Dr. Shamsh Kassim-Lakha, Chairman of the Board of Trustees of UCA, in Vancouver last week. “I am excited by this initiative and the chance to partner with a new university in an often underserved part of the world,” said UBC President Santa Ono. EDITOR’S NOTE: This is part three of a Devex series that examines the Aga Khan’s plan to create a new model for higher education in Central Asia, where the opportunity to achieve academic excellence is usually found somewhere else. Read part one here and part two here. Naryn, Kyrgyzstan — In the 15th century, a grandson of the Central Asian conqueror Timur — or Tamerlane — sought to turn the city of Samarkand into an intellectual capital of the Persian Empire. His name was Ulugh Beg, and he ruled over the territory now referred to somewhat dismissively as “the Stans.” Ulugh Beg built one of the largest astronomical observatories in the world, with an 11-meter sextant, and he used it to calculate the timing of eclipses. “Central Asia, a thousand years ago, led the world in trade and investment, in urban development, in cultural and intellectual achievement. This was the place that leading thinkers from around the known world would look to for leadership,” said Prince Karim Aga Khan IV, at the inauguration of the University of Central Asia in Naryn, Kyrgyzstan, in October. The Aga Khan Development Network, a multi-disciplinary development organization founded and led by the Islamic royal billionaire, is trying to rebuild Central Asia’s educational and intellectual infrastructure. The University of Central Asia will operate in three countries — Kyrgyzstan, Tajikistan and Kazakhstan — and draw students from across the region. Its aim is to create the next generation of Central Asian thinkers, scientists and leaders. The university, however, has taken a big risk and faces an uphill battle. UCA’s graduates will have the language skills and educational training that would propel many young job seekers to higher-paying opportunities abroad. The Aga Khan’s vision is that these students find opportunities for leadership in their own region. Whether that vision comes to fruition will depend on whether UCA can tailor the education students receive to the specific practical challenges facing their own communities — and whether the university can establish a network of graduates and researchers who will become Central Asia’s job creators. The University of Victoria (UVic) and the University of Central Asia (UCA) signed a memorandum of understanding earlier this month to affirm their intent to foster multi-faceted academic cooperation, faculty and student mobility, and joint research collaborations. The University of Central Asia (UCA) and the National Research University’s Higher School of Economics (HSE) signed an agreement on 14 February 2017 in Moscow, Russia. HSE will develop curriculum for UCA’s undergraduate programme in Economics and contribute towards faculty development. UCA has the field experience and data on economic challenges in Central Asia, and HSE will provide the analytical expertise, including exchange of faculty and students, and collaborate on joint research. The Mayor was speaking at an Open House hosted by UCA for prospective Grade 11 students, parents, and high school administrators from across Kyrgyzstan. During the day-long affair, students and their parents were introduced to UCA and its core specialisations: Computer Science; Communications and Media; Earth and Environmental Sciences and Economics. ASTANA – It seems economics and law have been eternally popular and cliché fields to study and work in former Soviet Union countries. The notion that one is guarantied a job afterwards has been fading away, however, with the arrival of the digital era and a competitive new world ruled by science and technology. “People go with law and economics because these are easy to do. They are concerned about getting a piece of paper rather than what they are going to do afterwards in life,” Bohdan Krawchenko, Director General at the University of Central Asia, told The Astana Times. The University of Central Asia, established under an agreement between the governments of Kazakhstan, Kyrgyzstan and Tajikistan and the Aga Khan Development Network that is building campuses in the three founding states. Most people who graduate from law school do not practice law or ultimately work in places that have nothing to do with the field. He noted universities offer law and economics courses because they get students, but economics departments do not train economists. “It’s from ‘narodnoye hozyaistvo’, or national economy, and used to train people for Gosplan (the agency that was responsible for central economic planning in the Soviet Union),” he said. “I have relatives who have earned these degrees and they don’t know anything. They are not even good accountants. They don’t have to take courses to become accountants. I think, it is first of all, something that is not sustainable,” he added. Societies need people in all kinds of technical fields, but the director noted students do not go into certain areas because there is a very significant drop in mathematical skills. Many people avoid engineering, computer science or “real” economics where one needs to know calculus and other such skills because they do not know math and instead go into areas where it is not needed. Krawchenko believes in today’s society, where technology is critically important, one must have some sort of math background and it is unfortunate many do not have it. High schoolers receive very little preparation in terms of career choices and as a result are left on their own. The University of Central Asia (UCA) in partnership with the Cambridge Trust is pleased to announce scholarship opportunities for doctoral study at the University of Cambridge, United Kingdom. The scholarships are for students wishing to pursue doctoral studies in the following fields: Computer Science, Engineering, Media and Communications, Business Management or Economics. Support for students entering a master’s programme as a pathway to a doctoral degree will be considered. The fields listed reflect some of the majors in undergraduate programme offered by UCA’s School of Arts and Sciences. Applicants from Kazakhstan, the Kyrgyz Republic, and Tajikistan are strongly encouraged to apply. Students from Afghanistan, Uzbekistan, Turkmenistan and northern Pakistan are also eligible. Applicants must meet UCA’s eligibility benchmarks, and admission criteria to the University of Cambridge. The scholarships are part of UCA’s ongoing Central Asian Faculty Development Programme (CAFDP) designed to ensure that scholars from the region are strongly represented in UCA’s faculty. Scholarship recipients will be required to work for three years at the University, after the completion of their studies at the University of Cambridge. UCA is Central Asia’s sole regional university with fully-residential campuses in Naryn, Kyrgyzstan, Khorog, Tajikistan, and Tekeli, Kazakhstan with state-of-the art facilities, small staff - student ratios, and with generous provision for faculty to engage in research. Australia, 12 September 2017 - The University of Technology Sydney (UTS), and the University of Central Asia (UCA), signed an agreement in Australia to strengthen the relationship between the Institutions and encourage cooperation in the field of Communications and Media on 12 September 2017. “We look forward to great things happening with this partnership,” said Professor Andrew Parfitt, Provost and Senior Vice President at UTS. “Although we have a strong international programme, with the largest number of students going overseas of any Australian university, this is the first time UTS will be involved with countries of the former Soviet Union.” Among the areas of collaboration between the two institutions are curriculum development, exchange of faculty and students, sharing of teaching resources and strategies, joint conferences, seminars, and exhibitions. Naryn, Kyrgyz Republic, 19 September 2017 - “UCA is an example others should emulate”, said the Prime Minister of the Kyrgyz Republic, Sapar Isakov, during his visit to the University of Central Asia’s (UCA) campus in Naryn on 19 September 2017. He asked the journalists accompanying him to photograph the campus facilities and share with their readers as an example of what is possible in Kyrgyzstan. The Prime Minister toured the campus, met with students and faculty in the classrooms, and even played a game of table tennis with a student. He was accompanied by the Governor of Naryn Oblast, the Mayor of Naryn, and senior government officials. Welcoming the Prime Minister, the Chairman of the Board of Trustees of UCA, Dr. Shamsh Kassim-Lakha, conveyed congratulations to the youngest Prime Minister in the history of the Kyrgyz Republic, and asked if he would share with the students the secret of his success. “Be yourself, and never compromise your principles,” said the Prime Minister when responding to a similar question during the question and answer session which followed his speech. The inaugural meeting of the University of Central Asia’s (UCA) Board of Trustees was held on 6 November 2017 in Gouvieux, France. 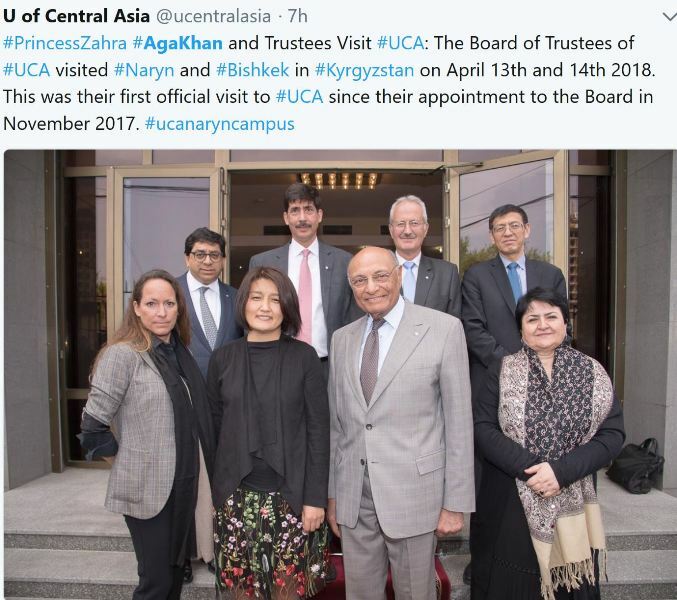 His Highness the Aga Khan, Chancellor of UCA, welcomed the Founding Trustees and urged them “to make research one of the highest priorities of the University. Only through the creation of new knowledge will we be able to address the multiple challenges that affect the quality of life of mountain societies. Over time, it is high quality and relevant research which will earn UCA a place among the renowned universities of the world.” He added that the stewardship of UCA was now in the hands of the Board of Trustees. Among the items discussed at the meeting were current programmes and future initiatives of the University. Inaugural Session of UCA’s Board of Trustees (6 November 2017). Front Row (L to R): Mrs. Elvira Sarieva, Prince Rahim Aga Khan, His Highness the Aga Khan, Princess Zahra Aga Khan, Dr. Shamsh Kassim-Lakha, Senator Byrganym Aitimova. Back Row (L to R): Mr. Naguib Kheraj, Dr. Hans Hurni, Dr. Shenggen Fan, Dr. Sharofat Mamadambarova. A day earlier (5 November), the Trustees received an orientation and briefing on AKDN and UCA. Presentations highlighted the vision and mission of UCA, the international Treaty and Charter executed by the Founders in 2000, current academic programmes and those in the planning phases, matters relating to the design and construction of the campuses, and the recruitment of students, and senior faculty and staff. An appointee of the Government of Tajikistan to UCA’s Board of Trustees is expected shortly. The University of Central Asia (UCA) and the Stockholm School of Economics in Riga (SSE Riga) signed a memorandum of understanding on February 14th 2018 in Riga, Latvia. The intended areas of cooperation include development of curriculum for UCA’s undergraduate programme in Economics, faculty and student exchanges as well as research cooperation. The University of Central Asia's (UCA) School of Professional and Continuing Education (SPCE) is officially accredited by the Cambridge Assessment English as a centre to offer English language examinations. Along Kyrgyzstan’s ancient trade route between China and the Mediterranean, known as the Silk Road, is the small town of Naryn. It’s a place where cars stop for the rush-hour herds of sheep, horses and yaks, which continue to fuel the area’s economy. Away from the town’s centre, unexpectedly rising next to the Tien Shan Mountains, are yellow, red and pink buildings, forming a most Instagram-worthy setting for learning. It’s here – where old world meets new – that the University of Central Asia will establish its first computer science curriculum with the support of the University of Toronto’s department of computer science. “We’ll be part of a huge mission that will have long-term effects on Central Asia, from helping improve the quality of education to invigorating the rural economy,” said Paul Gries, an associate professor, teaching stream, who was part of a U of T computer science visit to the region. The University of Central Asia is a secular, private and not-for-profit university founded by the governments of Kazakhstan, Kyrgyzstan, Tajikistan, and the Aga Khan Development Network. U of T President Meric Gertler and Munk School of Global Affairs distinguished researcher Shamsh Kassim-Lakha, who is also chairman of the Central Asian university's board of trustees, signed a memorandum of understanding to work together on curriculum and faculty development, faculty and student mobility and joint research collaborations. Last year, administrators from the University of Central Asia visited U of T computer science. Steve Engels, an associate professor, teaching stream, helped facilitate the early stages of the partnership, and visited Naryn when the campus was still under construction. “For our own benefit, it gives us a chance to take a second look at the work we're doing and reorganize some of our own curriculum,” said Engels, who worked closely with David Liu, an assistant professor, teaching stream, on the initial phases of the program design. The U of T faculty met with students who will take the computer science courses they’ve designed, starting next year. And, they were able to enjoy some of the food specific to the region (photos left and right). Industry will also be a vital part of the Central Asian university’s success. Local software company, SpalMalo, shared the challenges they face when seeking talent, as educated students typically move on to wealthier regions or countries, so exposure to local opportunities through internships and placements will be key. Like the town itself, population 35,000, the Naryn campus is small: Only 15 students per class, though eventually there will be two cohorts and 30 computer science students in total, whereas more than 350 undergraduates will graduate from the U of T computer science program this spring. Faculty will also live on Naryn campus which also offers media and communication studies. University of Central Asian campuses in Tajikistan and Kazakhstan will focus on other subjects from earth and environmental sciences to business and engineering. “It was an incredible experience,” said Gries of visiting Kyrgyzstan. He will plan the university's second-year software design course. The University of Central Asia’s (UCA) Naryn Campus was buzzing with activity as a team from Indiana University (IU) in the USA and the American University of Central Asia (AUCA) highlighted their latest findings. Based on archaeological research over the 6 years on the sites Aigyrzhal-2 and 3 located on UCA’s Naryn Campus, it was revealed that the Naryn Valley has a long history of human occupation. I have spent the last month in Central Asia, a part of the world that has always seemed unreachable. Unreachable until the opportunity arose to volunteer with the University of Central Asia. This institution has two campuses located among the highest mountains in Central Asia: in Naryn, Kyrgyzstan and Khorog, Tajikistan. A third campus is under construction in Tekeli, Kazakhstan. Dushanbe, Tajikistan, 5 September 2018 - The Ministry of Education and Science of the Republic of Tajikistan and the University of Central Asia (UCA) took a key step forward by signing an Agreement of Cooperation to enhance their mutually beneficial relationship with “the aim of preparing highly educated professional specialists who are able to meet competition in internal and external labor markets, introducing new methods of education, improving the quality of education, as well as carrying out the educational activities” at UCA’s School of Arts and Sciences, Khorog, Tajikistan. The agreement was signed on 4 September 2018 by the Minister of Education and Science, Professor Nuriddin Said, and the Chairman of the Board of Trustees of UCA, Dr. Shamsh Kassim-Lakha, at the Ministry of Foreign Affairs of the Republic of Tajikistan. Also present at the signing were the Deputy Minister of Foreign Affairs, Mr. Ismatullo Nasredin, the Rector of the University of Central Asia, Prof. Dr. S. Sohail H. Naqvi, along with other senior officials of the ministries and UCA. UCA was founded in 2000 as a private, not for profit, secular university under a Charter promulgated through an International Treaty signed by the Presidents of Tajikistan, the Kyrgyz Republic, Kazakhstan and His Highness the Aga Khan; ratified by the respective parliaments, and registered with the United Nations. The new residential campus of UCA’s School of Arts and Sciences at Khorog provides a unique opportunity for talented students from Tajikistan to interact with their peers from the other two founding states of Kyrgyzstan and Kazakhstan, as well as neighbouring countries, to address challenges and issues common to their mountain regions. These include the impact of climate change, new paradigms of economic development, and opportunities afforded by the rapid development of information technology systems and networks. Khorog, Tajikistan, 14 September 2018 - In what was a historic milestone, the University of Central Asia’s Khorog campus was formally inaugurated today by Tajikistan’s President Emomali Rahmon. The Khorog campus is the second campus of the University to become operational since its Naryn campus was inaugurated in Kyrgyzstan in 2016. The University of Central Asia (UCA) was founded in 2000 as a private, not for profit, secular university through an International Treaty signed by the Presidents of Tajikistan, Kyrgyzstan, and Kazakhstan, and His Highness the Aga Khan; ratified by the respective parliaments, and registered with the United Nations. The Presidents are the patrons of the University, and His Highness is the University’s Chancellor. UCA’s mission is to promote the social and economic development of Central Asia, particularly its mountain communities, by offering an internationally recognised standard of higher education, and enabling the peoples of the region to preserve their rich cultural heritage as assets for the future. 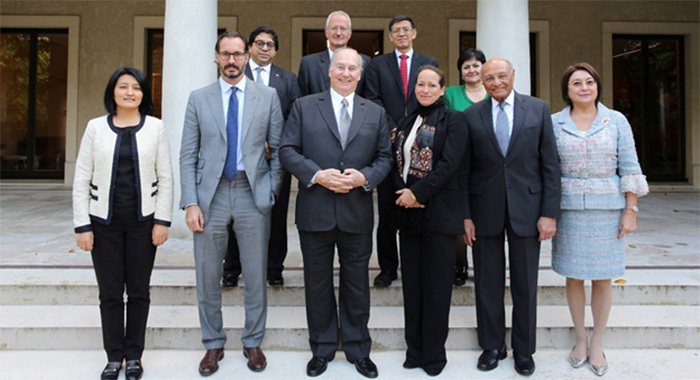 The University brings with it the commitment and partnership of the broader Aga Khan Development Network (AKDN). The majors offered at UCA in Khorog are Economics and Earth and Environmental Sciences. At the Naryn campus, Computer Science and Media and Communications are offered. The University’s third campus in Tekeli, Kazakhstan, is expected to open by 2022, and will offer Business Management and Engineering Sciences. The Mountain Societies Research Institute of UCA is also located at the Khorog campus to allow closer integration with the Department of Earth and Environmental Sciences. This Institute is also involved in developing the research capacity of the Faculty of Natural and Biological Sciences at Khorog State University. Since 2006, the UCA’s School of Professional and Continuing Education (SPCE) has been responding to community needs with 12 learning centres in Tajikistan, Kyrgyzstan, and Kazakhstan, as well as six in Afghanistan. Over 12,000 learners participate in these courses each year, of which 53 percent are women. To date, over 120,000 have graduated from SPCE’s programmes. The architectural design of the master plan of UCA was prepared by the award-winning Japanese architect Arata Isozaki. The buildings on the campus, which represent its first phase, were constructed largely by small and medium size Tajik contractors to ensure maximum economic benefit for the local and regional economy. The investment of US$ 95 million in the Khorog campus was provided by the AKDN, supplemented by a soft loan from the Overseas Private Investment Corporation of the United States. In the first phase of campus construction, UCA operations created more than 1,400 jobs in Tajikistan and Kyrgyzstan, 90% of which were offered to local residents. The University also created over 200 permanent new faculty and staff jobs in Naryn and Khorog. To extend quality healthcare services to the Khorog community, AKDN’s Khorog Medical Centre is currently under development. In addition, two kindergartens and a training centre for early childhood educators has also been established. In Khorog, UCA has also played a positive role in improving infrastructure. It has paved roads to Dasht Village from the main town, a gravel road to Upper Dasht Village and an access road from the community of Khitjd. The University also installed streetlights in the area. The University of Central Asia’s (UCA) undergraduate campus in Tajikistan is located in Khorog, 2,100 metres above sea level on a site gifted by the Government of the Republic of Tajikistan. Phase I construction of the UCA Khorog campus was completed in 2017, and includes an academic block, laboratory building, student life building, and residences. The Khorog Campus houses a library, classrooms, a computer lab, student common spaces, dining hall, administrative offices and faculty reception, offices and residences. Each UCA campus features secure, modular dormitories, and athletic facilities including a football pitch, tennis courts, and a Sports Bubble that offers indoor athletics year-round. Majors offered at the Khorog Campus include Economics (BA), and Earth and Environmental Science (BSc). The University of Central Asia’s Khorog campus in Tajikistan was officially inaugurated on 14 September 2018, joining the world-class centre for knowledge and learning, which connects isolated rural communities with the global community. The Khorog campus is the second to become operational after UCA's Naryn campus was inaugurated in Kyrgyzstan in 2016. Alyna Rahim was born and raised in Karachi, Pakistan. She is twenty years-old and spends her free time doing origami, listening to music, occasionally singing, and reading mystery novels. Prior to joining UCA, Alyna volunteered in her community and believed living in UCA’s diverse environment would enable her to learn new cultures and better understand her own. She aspires to become a cryptanalyst or a data scientist after graduation. After her first year at the UCA Campus in Naryn, Kyrgyz Republic, she was recognised as the top student in her class and was honoured on the Dean’s List. This interview is part of a series featuring UCA undergraduate students’ reflections after completing their first year at the university. This series is a joint collaboration between the University of Central Asia and Aga Khan Foundation Canada. BISHKEK (TCA) — Arata Isozaki, the renowned Japanese architect, and designer of the master plan of the University of Central Asia (UCA), has won the coveted Pritzker Architecture Prize for 2019. He is the 46th Pritzker laureate, and the prize of $100,000 will be awarded at an official ceremony in May at the Chateau de Versailles in France. Among Isozaki’s over 100 notable architectural designs are the Kyoto Concert Hall in Japan, the Museum of Contemporary Art in Los Angeles, and the Weill Cornell Medical College in Qatar. He is also the designer of the master plan of the University of Central Asia, and its three campuses located in Khorog (Tajikistan), Naryn (Kyrgyzstan), and Tekeli (Kazakhstan), which has a set a new standard for university design in Central Asia. UCA’s design has received widespread attention for responsiveness to its mountain locations, and the environment it creates for study, contemplation, and play. The annual Pritzker Prize was established in 1979 by the Pritzker Family of Chicago, and is awarded to “an architect who has produced consistent and significant contributions to humanity through the art of architecture.” The laureate is selected by an independent jury of five to nine professionals, and past winners include architects Philip Johnson, Frank Gehry, Rem Koolhaas, and Zaha Hadid. In 2001 Isozaki also served on the Master Jury of the Aga Khan Award for Architecture, where over $1,000,000 is awarded to winners every three years for projects that set new standards of excellence in architecture, planning practices, historic preservation, and landscape architecture. The University of Central Asia (UCA) was founded in 2000 as a private, not for profit, secular university through an International Treaty signed by the Presidents of Tajikistan, Kyrgyzstan, and Kazakhstan, and His Highness the Aga Khan; ratified by the respective parliaments, and registered with the United Nations. The Presidents are the Patrons of the University, and His Highness is the Chancellor. UCA’s mission is to promote the social and economic development of Central Asia, particularly its mountain communities, by offering an internationally recognized standard of higher education, and enabling the peoples of the region to preserve their rich cultural heritage as assets for the future. The University brings with it the commitment and partnership of the broader Aga Khan Development Network. The majors offered at UCA in Khorog are Economics and Earth and Environmental Sciences. At the Naryn campus it is Computer Science and Media and Communications. The campus in Tekeli, Kazakhstan, is expected to open by 2022, and will offer Business Management and Engineering Sciences.